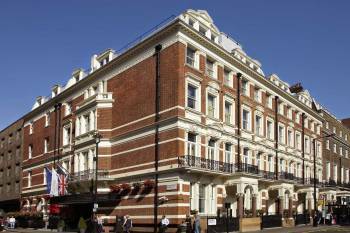 Our warm and inviting DoubleTree by Hilton London – Marble Arch hotel offers an ideal location in the heart of the West End. Enjoy close proximity to popular London attractions including the West End theater district and Hyde Park. Discover great shopping opportunities at Oxford Street, just steps away from our convenient Marble Arch hotel.Enjoy a freshly baked DoubleTree chocolate chip cookie, straight from the oven, when you check-in at our London West End hotel. Make yourself at home in a comfortable guest room with a fantastic range of amenities including a spacious bathroom with rain shower, MP3 alarm clock radio, a 40” HDTV and a generous work surface for business travelers.